I obviously missed this one but back in early August the Coast Guard celebrated its 215 year anniversary. According to this blurb I came across this morning, the CG officially began in 1790 when Congress authorized the construction of a fleet of “revenue marine” cutters. Essentially tax nazis under sail, the cutters were responsible for enforcing “…the nation’s tariff and trade laws..” as well as protecting the collection of federal revenue. The Coast Guard as we now know it received its name in 1915 when the Revenue Cutter Service merged with the Life Saving Service. I’ve been boarded by the Coasties…underway no less. I was on the maxi Javelin as first mate making way through the C&D canal (between the Chesapeake and Delaware Bays) under power when suddenly a tender roared up out of nowhere. Before we knew it three very serious and polite young men were standing on the deck. Our only real concern was an open seacock down in the port head…the Captain had the sense to speak loudly enough for our chef (she was making a pot of coffee below decks) to hear what was going on and initate the emergency “boarded by Coasties” drill – which consisted of closing the seacock and stowing a dummy porta potty in the head. High drama, yes. But when you’re actually in need of them (and they’re there)…it’s surely a welcome sight. Have a great weekend! I tend to stay away from tabloid fodder but this was just too good to ignore. According to an article in the Gulf of Bahrain Daily News, a London couple’s marital spat dissolved into destructive mayhem (as they often do) – the wife put their allegedly £100,000, 35 foot sailboat code named Rebel up for a fire sale at the low, low price of £40,000. They had apparently sailed the Med together in the craft and the husband, incensed that his wife was selling, took an axe to the seacock and sunk it. No background on the cause of their marital distress - but it’s not hard to imagine that she discovered him in flagrante delicto with her best girlfriend aboard the good ship Rebel after coming home with a headache mid shift (she’s a waitress) and proceeded to freak out, demand a divorce and all the other things a wife does when she finds her husband helming an illicit vessel…now disgusted by the boat upon which they’d once enjoyed romantic moments under sultry Mediterranean breezes (and needing money for her lawyer) she decided to screw him and sell it. He reads the ad in the paper over morning coffee and reaching for his trusty axe swears that he’ll see Rebel at the bottom before she’ll get one blasted dime…something like that. The Museum of Yachting recently held it’s 26th annual Classic Yacht Regatta…according to this first hand account, “…a boating version of a classic auto "Concours d'elegance," The event was held off Fort Adams in Newport, RI over Labor Day weekend September 2 - 4. 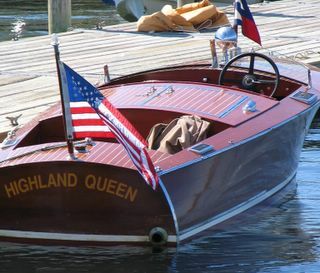 According to the official results sheet, the 1935 Herreshoff ,”Osprey" dominated the contest. 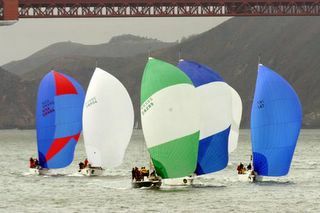 Though I was not fortunate enough to attend I agree with the reporter, there’s absolutely nothing like witnessing a fleet of these classic boats competing under sail. We owe a debt to organizations like the Museum of Yachting for promoting and driving classic regattas. Blogging from the JetBlue terminal at JFK. Hold Fast says Pride II crewmembers have (had) a blog with plenty of photos of the dismasting carnage (see earlier post "Pride II Goes Down). The url doesn't work though - does anyone have update? A good read here in the Portsmouth Herald on the recent dismasting of the Pride of Baltimore II on September 5. I wrote about the Pride II last spring – she’s a 108-foot topsail schooner owned by the state of Maryland and built to the lines of an 1812-era Baltimore Clipper. 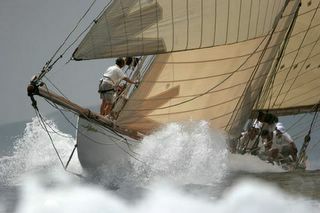 The original Pride was lost in 1986 off the coast of Puerto Rico to a sudden force of wind deemed a “microburst squall.” As the article discusses…following suit Pride II was also caught in a violent squall…in this case she was southbound off the coast of France. Three people, including the Captain, died in the first accident…in the more recent disaster no one, fortunately, lost their lives and despite the carnage from the dismasting, Pride II was able to motor 80 miles into St. Nazaire, France for repairs. Strange how history repeats itself...as the reporter points out, one constant is the inherent danger of going to sea. On another note...does anyone doubt the existence of giant squids? 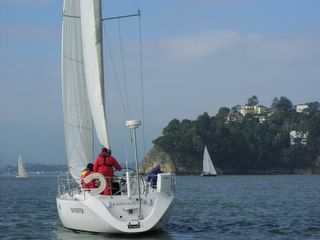 Have a gander at Wingsail's blog. The sailing world seems to be picking up steam heading into the fall – here’s brief but interesting blurb from SF-based KRON on Egyptian researchers who constructed a 40 foot sailboat from reeds, date-palm fibers and bitumen tar and tried to sail it from the Arabian peninsula to India in order to prove that sailors plying the trade route over four thousand years ago made the trip safely in similar vessels. The boat sank on the first day so it’s back to the drawing board. 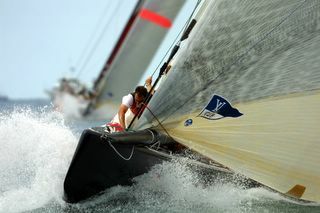 The 35th annual Newport Boat Show is set to open this weekend in my favorite sailing town. More than 800 exhibitors will show about 600 boats, which will be displayed on the waterfront running along America's Cup Avenue. 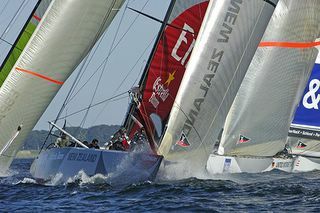 Last but not least the country's largest and most profitable charity regatta, the Hospice Cup on the Chesapeake Bay raised a record $600,000 for eight area hospices despite an utter lack of wind. The wrap-up in the Washington Times mentions Jim Muldoon's 70 something foot maxi Donnybrook. I believe it’s a Santa Cruz…I once crewed for Jim at the Rolex Regatta in St. Thomas in the late 90’s and recall the boat being quite the sled. Muldoon is not a man you want to disappoint…I’ll leave it at that. 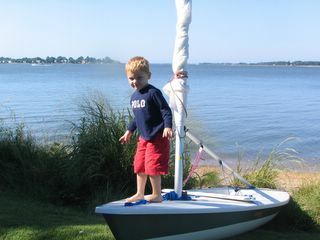 The Laser in question (see last post) with Will, our three-year old, balancing on the bow. 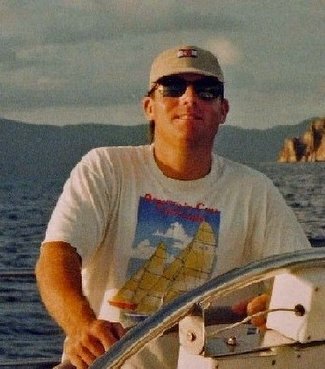 I had a comment from Jarrett in my email this morning - see his sailing weblog here - about my recent post on the Laser...and why I loved the sense that the Laser gives you of being one with the wind and water. 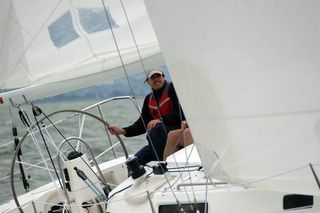 Thank you Jarrett for taking the time to remind us that "You can sail a small keelboat and be plenty close to the water." He continues, "...I have South Coast 23, Alberg-designed. It heels in a nice breeze, and when it's not heeling you can put your hand over and dip it in the water. And you can anchor, go below and get out of the sun, and actually use the head." 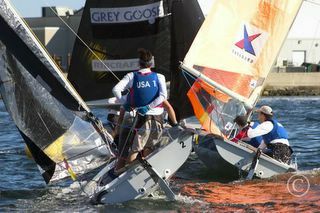 Just in off the water from a Labor Day sail on our Laser. It's a beautiful afternoon on the Chesapeake Bay...sunny and cool with just the right amount of air to get the boat nicely making way. 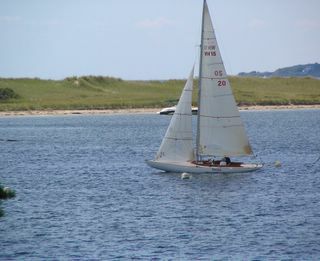 Though I love bit boat racing there is something about being so close to the water, an ability to feel a oneness with the boat that you just don't get with a keel. 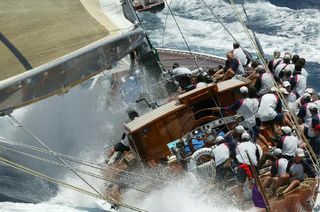 My mind is gelled from the sail so nothing to point you to today...we'll be back in the swing of it tommorow.